Today I will take care of me. End of story. If it brings you joy, say yes. If it doesn’t, say no. Sometimes it isn’t possible sticking with a cut and dry answer, but many times it is just this simple. Negating people and situations you know guarantee misery is a vital part of self care. Self care isn’t selfish; it’s necessary even if it means disappointing others. Slipping back into people pleasing mode is always a real possibility for recovering doormats, so before saying ‘yes’ to anybody, consider first, if you’re saying ‘yes’ to yourself as well. Thank You for the reminder.” I am definitely getting better at taking care of my self but it is always nice to be reminded. 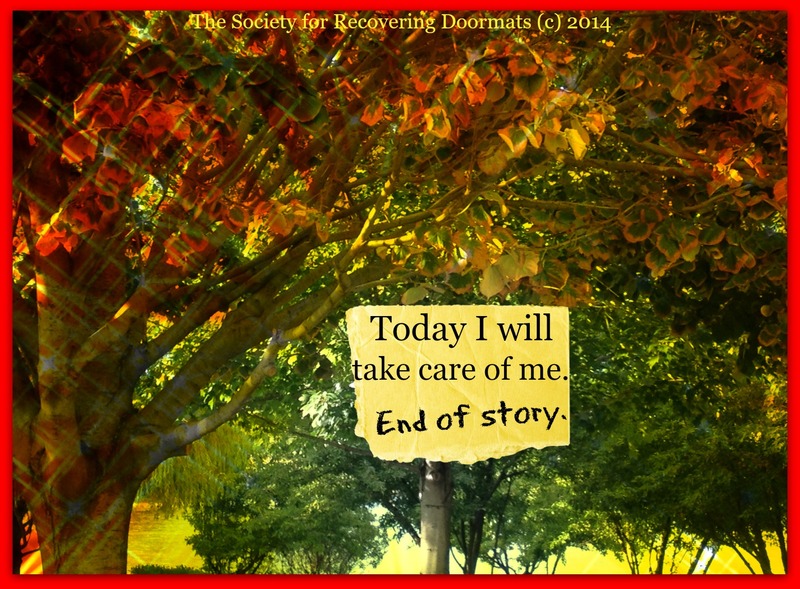 I am also in another recovery program, they use the saying, THIS IS A SELFISH PROGRAM. That has always stuck with me. But, just wanted to say Thank You. Thanks for letting me know, and so glad you’re here. If your’e on FB, Twitter and Instagram, please follow me there too. We can never have enough reminders to take care of ourselves. Happy Holidays. <3 Rose G.
So glad you are here and on Facebook. You provide a lift in my day and reminders that I need while on my journey to a new me! I use to be a door mat. Now I’m not. He pass away. Reblogged this on kelly1025's Blog.